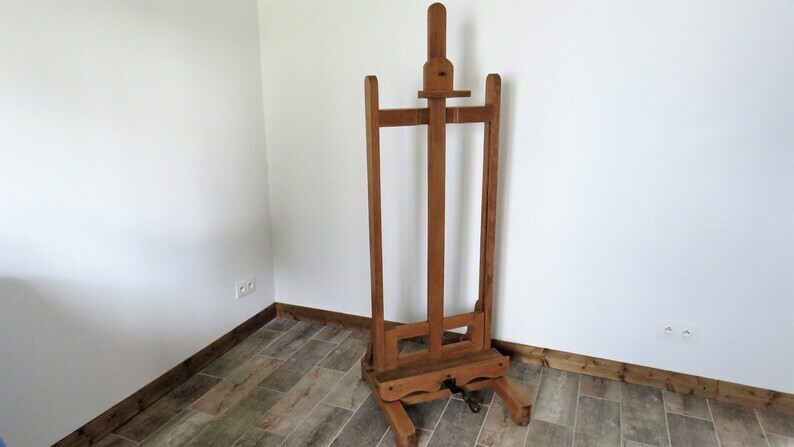 This grand, late 19th century, early 20th century, antique french, oak artist's easel, has its original functioning crank mechanism to adjust the tray. This easel can handle impressively large canvases. Minimum height is 66" and maximum height is 100". The Easel is clean, there are no loose joints and the raising mechanism works well. In very good condition. PLEASE CONTACT ME BEFORE PURCHASE, TO DISCUSS SHIPPING PLEASE!